Over the past year McGill’s Social Equity and Diversity Education Office (SEDE) hired a trio of Education students who have since been leaving their mark on our community and the University. Teyesha Mullick, Carmen Villa and Rachel Zellars of the Department of Integrated Studies in Education each have different roles with SEDE and with the community, but, in an interview with the Reporter each of them had plenty to say about their experiences. Through a formal partnership established in 2014, where each benefits from and extends the expertise and reach of the other, SEDE and the Faculty of Education work in tandem to strengthen equity and diversity education at McGill and beyond. Over the past year McGill’s Social Equity and Diversity Education Office (SEDE) hired a trio of Education students who have since been leaving their mark on our community and the University. Broadly speaking, SEDE’s goal is to foster respect and understanding among different cultures on and off campus, bringing students in touch with local communities through a variety of programs and services. Teyesha Mullick, Carmen Villa and Rachel Zellars of the Department of Integrated Studies in Education each have different roles with SEDE and with the community, but, in an interview with the Reporter each of them had plenty to say about their experiences. Stephen Lalla (SL): What do you do at SEDE? Teyesha Mullick (TM): I work with SEDE Equity Advisor Sarah Malik as the Project Evaluator for SEDE’s Public Awareness Strategy. The Public Awareness Strategy adds to and addresses social inclusion and diversity at McGill by clearing the fog surrounding the concepts of social equity and diversity, through its pilot phase consisting of a poster series, website and videos, and later through online workshop modules. SL: Have you enjoyed this experience? TM: Try as I may to avoid sounding like one, I sense this answer will resemble your average daytime talk show guest’s. Fact is, working at SEDE has been the best part of my experience in Montreal so far. It has been a space where I have been able to learn immensely about social equity and practical ways to make it easier to understand and talk about. Very important work is being done for vital issues by an organization filled with people who are passionate about what they do and who, frankly, make you happy just to be there. SL: And how does your work with SEDE tie in to your studies? TM: I am in my second semester of my MA in Educational Leadership. Being able to learn about the ways SEDE makes information on social equity and diversity tangible and accessible is helping put the more abstract theory that I study into perspective. It is often too easy to get lost in academic jargon, so having the opportunity to evaluate public education initiatives is helping me see direct links between what I’m hearing in the classroom and what that would look like outside those four walls. An immediate impact is that my time at SEDE is helping me have a clearer picture of what I want my thesis research on social equity to look like. More than this, it has been hugely gratifying to learn how important it is to focus on social justice education, an area I hope to continue working with, and how committed everyone here is to spreading the word and making these concepts engaging. As a selfish aside, I hope to replicate my experience at SEDE wherever it is that I get to work next. Carmen Villa (CV): I am coordinating the McGill volunteer mentor program at la Maison des Jeunes de la Côte-des-Neiges (MJCDN). MJCDN is a youth center in the Côte-des-Neiges neighbourhood that provides a safe space and ludic activities to youth from 12 to 17 years old. This program began in January of this year, and I’ve been in charge since then. SL: What are your duties? CV: My duties consist of recruiting the volunteer mentors among McGill students and training them. I program activities at MJCDN that help to build a relationship between the youth at MJCDN and the students from McGill, and that help the youth to engage in educational activities that help them to re-value and add different meaning to education in general, and that can help them to have a better academic performance at school. These activities vary from homework support to workshops on issues of inequality, to guided visits to museums. SL: And how has the experience been so far? CV: As this program is new, I would describe the experience as very challenging, and at the same time very enriching. During these months I have had to read the dynamics of the youth and understand their interests, at the same time I have had to program activities that are interesting and enriching for both McGill students and the youth. However, it’s been an amazing experience, and you can see the positive results of the work McGill students do at MJCDN in a very clear way. SL: How does this relate to your academic work with the Faculty of Education? CV: I am doing a master’s degree in educational leadership; I just finished my first year. This program has given me the opportunity to lead an educational program outside the school context, and in a context where it is very important to be aware of issues as social inequality, racism, classism and other forms of discrimination. Rachel Zellars (RZ): I am coordinating a project on implicit bias and employment equity for the University, which I began working on last winter. Most of my time is spent studying the history of implicit bias research broadly, in the context of employment practices more specifically, and also in the context of critical race theory. SL: Have you enjoyed your work? RZ: My experience has been just fantastic, and I can’t really express my gratitude fully for the opportunity to research and learn about implicit bias in such a supportive work environment. Implicit bias has become a much-invoked topic of late in the context of the hyper-visibility of police killings of Black men and children in the US, reinvigorated conversations about excessive police force and corruption, and an expanded awareness of mass incarceration. I am grateful to have a solid body of research under my belt that allows me to come into this conversation meaningfully, critically, and well prepared. This feels important to add, as well: I am a single mother to three small children and a full-time PhD student, and the flexibility in scheduling and support SEDE has offered me while I am working on this project is outstanding… and incredibly rare. SL: How does this employment relate to your studies here in the Faculty of Education? RZ: I am in DISE, currently a PhD4 within the Department. My research, in part, tries to articulate a critical race theory that is useful and relevant within a Canadian historical context. I have also studied race, structural racism, and slavery, in some capacity, for the last 20 years. When I was in law school, I also taught constitutional law to high school students at an alternative high school outside of Los Angeles — a very pragmatic constitutional law, let’s just say. Yet, I have avoided—rather dismissed—the relevance of implicit bias in my thoughts and conversations about race and racism for the last 20 years, namely because I have considered racism as acts committed by individuals or institutions with intentionality. I am rethinking the place, now, of implicit bias in my work as an educator and education researcher, as well as within conversations about racism, more broadly. I also have the honour of facilitating workshops on race and racism in the classroom with both university and high school students, and I have incorporated my research on implicit bias into my workshops. 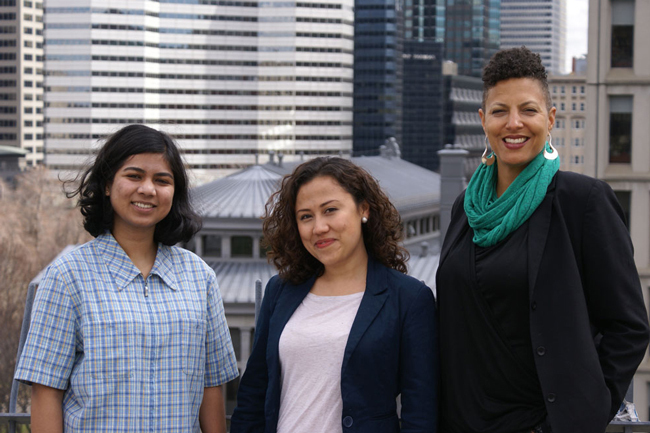 Through their work with SEDE, Teyesha, Carmen and Rachel are making the best of their opportunity to directly impact the community in positive ways. By applying their scholarly interests beyond the confines of the academic world they are sure to enrich not only their own lives, but also those of our campus, community and city at large.